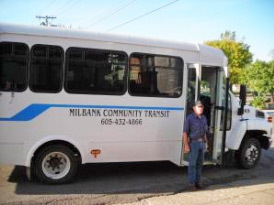 Milbank Community Transit provides affordable public transportation in and around Milbank. Milbank Community Transit has 2 buses and 2 vans available for use of which 2 are wheelchair accessible. If you would like to make a contribution to this program directly, please mail your check to Milbank Community Transit PO Box 406 Milbank, SD 57252. If you have any questions or would like to schedule service, please call 605-432-4866.